You're probably going to want something to wash that down. Whether it's a frosty beer or a fresh lemonade, nothing goes with a hot bowl of chili like a cold drink. 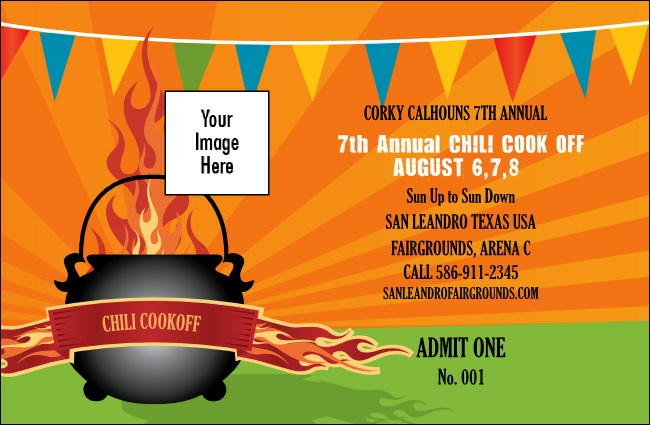 The Chili Cook-Off Drink Ticket template with a flaming hot kettle surrounded by rays of light matches the Chili Cook-Off Event Kit and helps you keep the bar in order while the cook-off goes on! We've got all the ingredients to keep your next event cooking at TicketPrinting.com.